PennsylvAsia: "Malaysian Tea House" at Pitt, March 22. 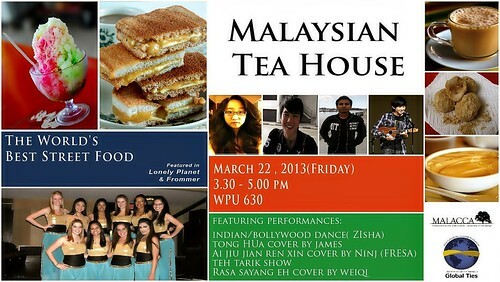 "Malaysian Tea House" at Pitt, March 22. Come and explore THE BEST STREET FOOD from Malaysia! Oh, did we tell you they are free? YES, all these food are FREE by Pitt Global Ties and Malacca! Korean film Hwang Jin Yi (황진이) at IUP, April 3. Pitt Night Market (匹大夜市), March 29. 2013 Kennywood Asian Day, May 12. 名所フィラデルフィア百景: 100 Famous Views of Philadelphia. Let the Bullets Fly (让子弹飞) at IUP, March 13. In the Mood for Love at Erie Art Museum, March 6.